I began my first job as an art handler like many of us, answering an ad for art handlers posted on a bulletin board. I didn’t even see the ad; a friend called and told me about it. I had never considered Art handling as a job. I didn't know anybody who did it for a living but I was just out of art school, hanging out and thought maybe I could do this for a while. A group of four of us talked about it and decided that we’d interview together. We were all friends and unemployed and needed the money. We scheduled a meeting and after the interview, I walked out the door thinking the interview went great and I had a job. What I wasn’t ready for and what I didn't really understand was the job description: drive a climate controlled, 5 speed transmission 2 axle box truck from Washington DC to where ever: California, Florida, Maine, etc…. and pickup and deliver art. I had never driven a truck, had little experience using a manual transmission and didn't really understand what I was suppose to do when handling the art. I came in on a Saturday for a test drive. Surprisingly, the guy who was giving the test turned out to be a friend from my old neighborhood, who actually had been class mates with a sister in grade school and had become an artist. I hadn’t seen him for years. ( Mike Semyan is a great painter.) After driving around the block and going over what all the buttons and switches did in the cab all he could say was good luck: get to wherever you’re suppose to go, pickup/ deliver the Art and come back home. The next week I was headed for Texas. It was all new, unknown, uncomfortably strange, dangerous and I loved it immediately. When I was an art student, I would work on stuff, most times I’d hit a wall and end up not knowing what to do next. 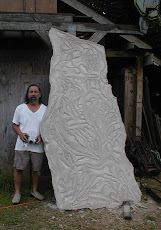 I’d work and after a while my carving teacher, Ken Campbell, would come by, shake his head and say turn it over and look at it again. It took me a long time to understand he didn’t mean the stone. I’d turn the stone over and over and after the dust settled, I’d still only see a carved rock and not a sculpture. It was only later that I understood that opposite, peripheral, complimentary, perpendicular thinking is a technique like another hammer or chisel that you find in your bag with the other tools only with practice and luck. From the National Gallery of Art, http://www.nga.gov/education/american/abstract.shtm: Artists make these transformations in an effort to communicate something they cannot convey through realistic treatment. Works of art that reframe nature for expressive effect are called abstract. Every now and then I would be involved in an Art Handling project that would make me struggle conceptually for reasonable answers. The road from idea to manufacture can be all curves and broken bridges. The problem generally would be something I’d never done before with new techniques I’d have to integrate and introduce to the client and the groups I work with. Last year a request came from the National Museum of Health and Medicine, located at the Walter Reed Army Medical Hospital in Washington DC. 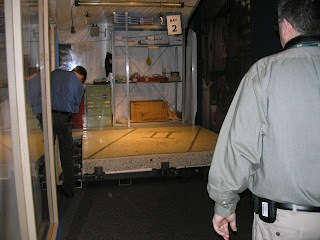 They wanted to move and place in exhibition a 7’ x 7’ x 7” concrete slab, cut out from the floor of a field hospital in Iraq. For the full story, here’s the link, http://nmhm.washingtondc.museum/exhibits/balad/balad1.html. The main problem: how to bring the object in through the front door, maximum width @ 54”, down the hall, past several tight turns and into the room where it would be displayed. Riggers had already been consulted but the Museum wanted another opinion. They requested the doors not be removed and that a display/ mounting solution be incorporated in the final design, weight of slab and mount approx. 2 tons. Turning the problem in my head, with great input from the client, meant understanding how to pivot the slab on its side, at an angle where the outside dimensions would ideally be around 53” maximum so that it would slide through the front door. The final structural, engineered solution would be a handling frame to protect the slab during transit, with an integrated rigging solution manufactured in the mount to rig the object/ mount with either a gantry or forklift to the required angle, then back down to its horizontal display position and finally, also be beautiful enough for museum quality presentation. I jumped at the chance to understand how to do that.